What if you could look in a second story window without even standing on your tiptoes? Giraffes can. Giraffes are the tallest mammals. Their legs are 6 feet long and so are their necks. Wild giraffes live only in Africa, but you can see them at the zoo. All About Giraffes – the tallest mammals. Their legs are 6 feet long and so are their necks. Giraffes have only two predators, besides humans, crocodiles and lions. 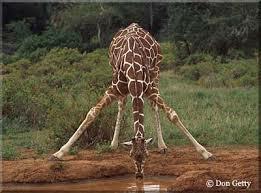 Giraffes are most vulnerable when they are taking a drink at a watering hole. They have to spread their legs wide to lower their necks. In this awkward position, they are easy prey for predators. Usually one giraffe keeps watch while another one gets a drink. If a giraffe is attacked, it kicks its attacker with its long legs and sharp hooves. Giraffes are most vulnerable to predators when they are taking a drink at a watering hole. They have to spread their legs wide to lower their necks. Giraffes have hearts that are 2 feet long. 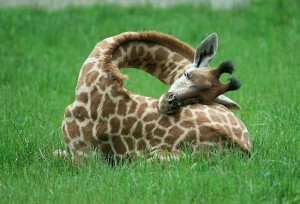 Giraffes sleep only five to 30 minutes every day. Usually they stand up to sleep. They only lie down if another giraffe can stand watch. Giraffes can run up to 35 miles per hour. These tall animals need a lot of food to keep them going. They eat up to 75 pounds of leaves every day. They love the leaves from acacia trees. These trees have long thorns but giraffes can eat around the thorns. 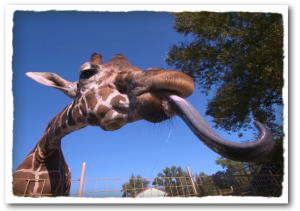 Giraffes have sticky tongues that can be 21 inches long! The spots on giraffes are unique, no two giraffes spots are the same, just like humans – no two fingerprints are the same. Giraffes have horns called ossicones – they are covered by hair and both male and female giraffes have ossicones. Males will sometimes use these horns while fighting. Giraffes sleep only five to 30 minutes every day. A video about a baby giraffe’s first steps. Giraffes have long, lush eyelashes to keep sand out of their eyes. Question 1: Why do Giraffes have such long eyelashes? Answer 1: Giraffes have long, lush eyelashes to keep sand out of their eyes. Question 2: How many babies do Giraffes usually have? Answer 2: Giraffes usually have just one baby at a time. The baby drops out of the mother 5 feet to the ground. Question 3: What do Giraffes like to eat? Answer 3: Acacia leaves and twigs are a Giraffe favorite. They also eat Flowers, Fruits and Vines. Question 4: How long do Giraffe live in the wild? Answer 4: It is estimated that a Giraffe can live up to 25 years in the wild and up to 40 years in captivity (Zoo). They live longer in captivity as they have no predators and plenty of food and shelter. It’s still better to see them living outside captivity. Question 5: What are the main predators of a Giraffe? Answer 5: Unfortunately Giraffe have predators such as Lions and sometimes Crocodiles. However, Giraffe are very agile animals and have a great awareness about them, they usually detect any threat of attack and make a run for it. Lions will generally attack a young Giraffe or injured. The Giraffes towering height will deter most predators. Question 6: Why has a Giraffe such a long neck? Answer 6: A Giraffe has a long neck for a number of reasons, the long neck allows them to survey the plains and spot predators such as Lions. They can also reach food high on tree branches. 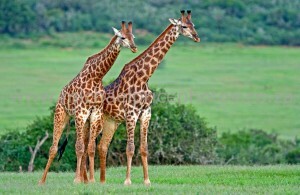 A Giraffe will also use their necks for what is called “Necking”. Necking is when Giraffes fight. They swing their necks wildly and use their heads as clubs. Question 7: Are Giraffes endangered? Answer 7: Unfortunately the giraffe population has decreased by over 30%. Poaching and sprawling cities and towns are the giraffes main threat. Enjoyed the Easy Science for Kids Website all about Giraffes info? Take the FREE & fun all about Giraffes quiz and download FREE Giraffes worksheet for kids. For lengthy info click here. Declan, Tobin. " Fun Giraffe Facts for Kids ." Easy Science for Kids, Apr 2019. Web. 21 Apr 2019. < https://easyscienceforkids.com/all-about-giraffes/ >.